If today’s university students really are the future of the country‚ then South Africans are soon going to be all about the individual. 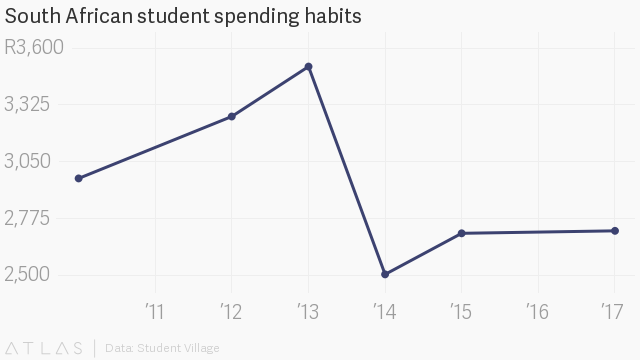 At least‚ that’s the finding of the most recent report on student spending habits‚ published on Tuesday by Student Village‚ based on results of over 3‚200 students countrywide. Brand “ME”‚ as the report calls it‚ means students mix and match various brands to bring out their look. In 2010‚ the first year of the report‚ students were more likely to use brands to portray their individuality. Students are also increasingly likely to pay for experiences and memories‚ rather than physical objects. Perhaps somewhat surprisingly‚ boys spend about R300 more monthly on average than girls‚ according to the report‚ although girls spend more on contraception and clothing while boys spend more on alcohol. Online shopping has also taken off among students: one in three say they shop online regularly‚ compared to just 3% of all South Africans. As has been the case in previous years‚ the average student spends more monthly than the average South African. This year‚ student spend increased slightly‚ to R2‚714 from R2‚702 a year ago‚ still down from a high of almost R3‚600 in 2013. At a time when youth unemployment in South Africa is well over 50%‚ the student spend report illustrates a stark divide between those who can afford to pursue a tertiary education and the many for whom that goal remains out of reach. Students received 85% of their spending money from their families. 29% of students already have a credit card‚ as they look to build their credit rating earlier. The number one bank among students was Capitec at 30%‚ followed by Standard Bank (23%)‚ ABSA (20%)‚ FNB at 18% and Nedbank trailing the pack at 12%. Last year‚ Capitec came in fourth among students but after a year of successful marketing on university campuses‚ comes in first.